The air to air and water heat pump provides heating and cooling via forced air as well as heating via radiant in-floor heat. This heat pump uses the outdoor air for a heat source, making it economical to install. Our air to air and water heat pump (ATF Series) heats and cools air for whole-home forced air heating and air conditioning, and heats water for in-floor heating. This air source heat pump has been optimized to work even in the coldest Canadian climates, featuring an oversized outdoor unit designed to maximize heating capacity in winter and to provide ultra-efficient cooling in the summer time. This heat pump is equipped with intelligent defrost logic, which minimizes the energy required to defrost the outdoor coil, improving efficiency and ensuring complete defrost every time. In addition, the compressor is located inside the home, which greatly increases the longevity of the machine and makes it easier to service in the dead of winter. Locating the compressor indoors also allows this heat pump to preheat domestic hot water via the built-in desuperheater. 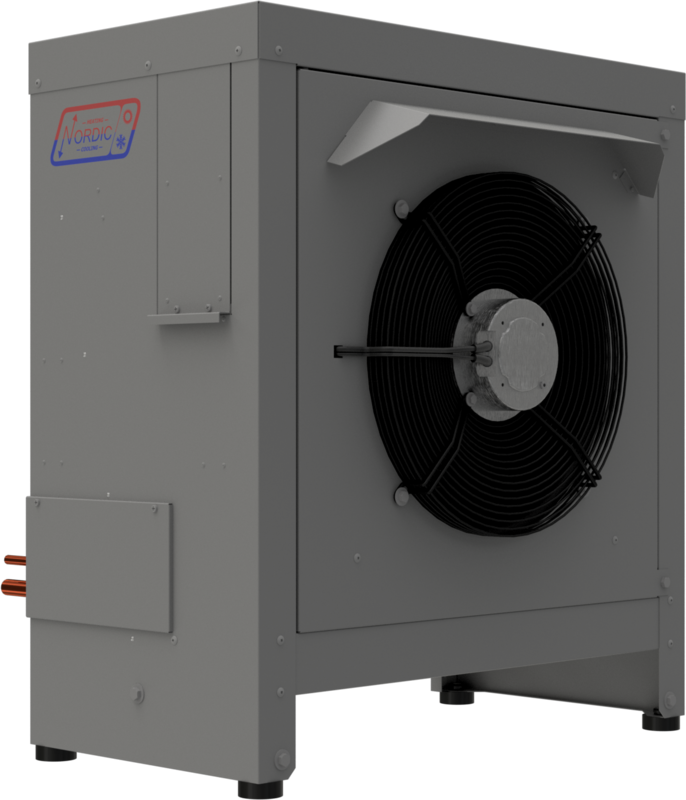 The ATF Series is available in sizes up to 6 nominal tons, so one machine can provide whole-home heating and cooling. The indoor unit features an industry leading 24″ x 28″ footprint, with a premium appearance. The air discharge is field-changeable from top to side. The large capacity outdoor unit provides superior heating in colder outdoor temperatures and ultra-efficient cooling in hotter climates. Both the indoor and outdoor unit fans are true variable speed with ECM-style motors, for comfort and energy efficiency. The intelligent defrost logic minimizes the energy required to defrost the outdoor coil. The outdoor ice channeling design removes the bottom tray and angles the outdoor coil to eliminate ice build-up. The Copeland Ultratech two-stage scroll compressor has double isolation for quiet operation and is located in the indoor portion of the heat pump for cold-weather service and better refrigerant and oil management. A double walled heat exchanger and ECM bronze head circulator is factory installed and provides domestic hot water preheating. The hydronic heat coil is a heavy duty coaxial type for excellent solids tolerance and resistance to freezing.